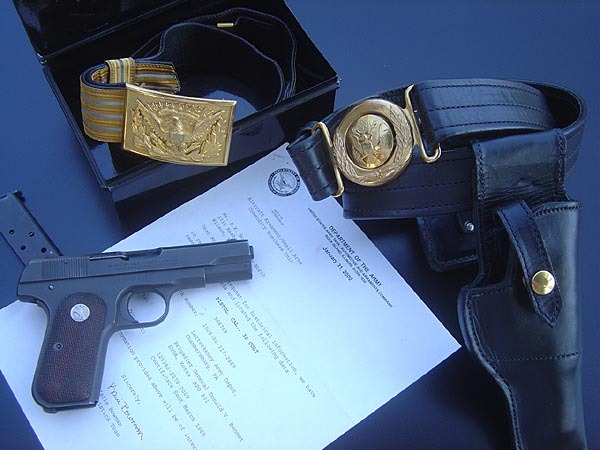 Colt Model M .32 ACP serial number 568749 issued to Lieutenant General Donald V. Bennett, Author of the book "Honor Untarnished". Graduate of West Point in 1940. Fought in North Africa, Sicily, and landed on Omaha beach on D-day as a Colonel of a mobile artillery Battalion. He is believed to have been the highest ranking officer to have landed on Omaha on June 6th (although cannot be proven), and was in the first wave of landing crafts. He was awarded the Bronze Star, Distinguished Service Cross and Medal, Purple Heart, Legion of Merit and Commendation Medal. After the war he became the Director of strategic plans and policy, the Superintendent of West Point, followed by Commanding General of the VII corps in Europe, Director of the Defense Intelligence Agency, Commanding General 8th U.S. Army, Commander in Chief of United Nations Command, and finally Commander of U.S. Forces in Korea. He retired in August 1974 as a 4 star General.